Within the last century, jobs have shifted from outdoor labor to indoor desk work. Customer service, accounting, programming, sales, design – all of these industries and more have individuals tied to desks for the vast majority of the work day. With the advent of computers, smartphones, and tablets, people easily spend 10 hours every day staring at electronic devices. Although these devices have increased productivity and made work easier, they have also increased the amount of time people sit, increasing poor posture and neck and back pain. Walking away from the job is just not an option. Instead, CNET recommends taking the time to create an ergonomically friendly desk, eliminating some of the wear and tear on your neck and back. Monitor placement – To keep from having a constant tilt to your head while looking at your monitor, place it at eye level. Test your monitor placement by closing your eyes and then opening them. They should naturally fall on the address bar for the internet. Move the monitor up or down so that it is in the right location. Once the monitor is in place, tip it slightly downward, avoiding reflections on the screen. Since you’re living in the time of touch screens, don’t put your monitor too far away. To test this, stretch out your hand. You should be able to easily touch your screen with the tip of your middle finger without having to lean forward. Multiple monitors – If you use two monitors at your job, place them at the same height. If one screen is your primary screen, center that one. If you use them equally, center them both. Don’t place any gap between the two screens, and make sure the distance away from you is right. Stretching or leaning forward throughout the day puts unnecessary wear on the spine. Keyboard and mouse – A pullout keyboard tray is the ideal place for your keyboard and mouse as you can customize the keyboard height with the tray. Your keyboard should sit where your elbows are at a 90-degree bend and your shoulders do not have any slump to them. Your elbows should sit at your sides, and the mouse and keyboard should sit a shoulder’s-distance apart. A slight downward slope to your keyboard is actually natural, following the slope of your thighs. Phone and other desk items – All items on your desk should be within easy reach so you don’t have to stretch to get them. Use the same technique you used for placing the monitor when deciding where to place items you use on a regular basis throughout the day. If you need an item that is farther away, stand up to reach for it rather than lean. Chair – Because workers spend so much time sitting at a desk, having the right chair means proper back support and spinal alignment. Choose a chair that supports your natural posture. Your tailbone should point slightly forward, and your bottom should be behind you. The chair also needs lumbar support for your lower back. An adjustable chair allows you to set the height appropriately. Your thighs should be horizontal, knees at hip level, and feet resting flat on the floor. There should be a little bit of space between the chair and the back of your knees. If you find yourself sitting in weird positions, tucking your feet behind you, or sitting on one leg, you probably need a different chair. Having an ergonomically friendly desk will not solve all of your problems, though. Penn Medicine points out that simply sitting all day long takes its toll on the back. Some simple solutions to this problem are making a point to walk whenever possible. Take a walk for lunch rather than eating at your desk. Set an alarm to remind you to get up and walk around the office space every 30 minutes. Invest in a sit-stand desk which easily allows you to go from sitting while working to standing at the flip of a lever. If you wear progressive glasses, invest in a pair that are strictly for computer work, keeping you from tilting your head up to see through the correct spot on the lenses. 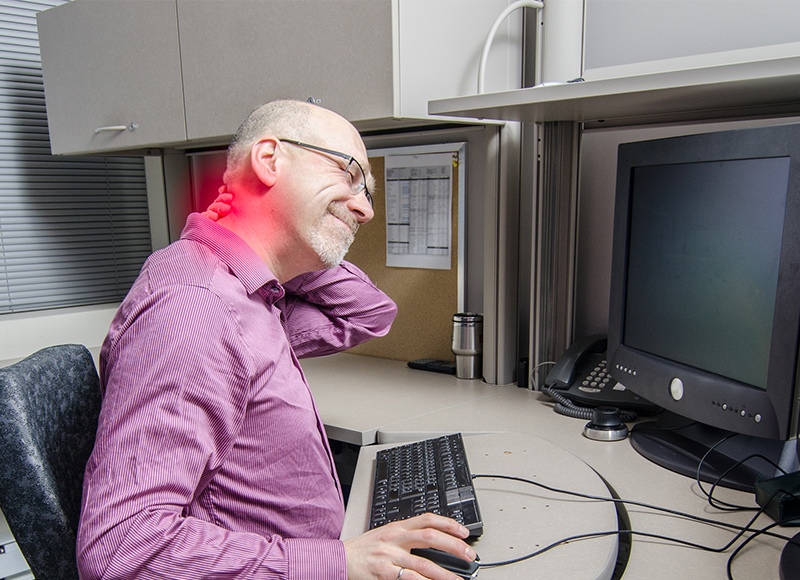 Technology is a wonderful thing, but don’t let it be the source of back and neck pain. Take the time to set up your workspace so that your technology works for you, not against you. If you are already suffering from nagging neck or back pain, contact the specialists at Atlanta Brain and Spine Care and see what they can do for you.